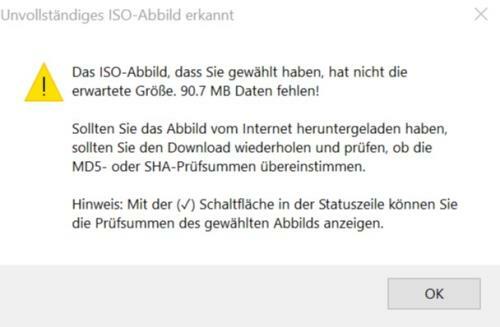 Also after the update: Error during the creation of the Rescue-ISO-file is not fixed! 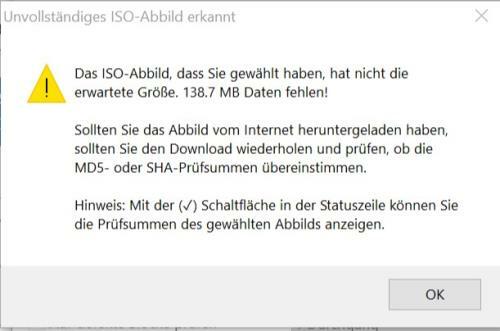 When trying again to create an ISO file for the USB stick, exactly the same error occurred as before the update. The ISO file was 112 MB too small after creation. I tested on two machines with the same result. This time each attempt ended with the described error. I just want to make you aware of this and kindly ask you to consider it in the next update. Thanks for getting in touch, you don't mention which build you are running. Build 3906 did contain some fixes ​for ISO creation issues, please be sure to update to this build. I had already updated to build 3096 when I did my retries. The new quality is that every time I tried it, an ISO that was too small was generated with wrong MD5 and SHA check values. The ISO files were about 100 MB too small. Your issue is unrelated to the fix in the last release and appears to be unique to your use case. Can you let us know what you mean by "ISO file for the USB stick". ISO files are for burning to CD/DVD not for USB media. Are you using a 3rd party ISO booting tool? The new quality is that every time I tried it, an ISO that was too small was generated with wrong MD5 and SHA check values. The MD5 of the ISO file may change for each build. What are you using as a comparison for MD5 if you are unable to create a good ISO file? Since many years I use the program "Rufus" for the production of my USB. It is a small handy program that converts the USB to MBR or GPT, partitions it and formats it to FAT32. Then the content of the ISO file is uploaded. I practice this without any errors. The direct transfer of the rescue system to USB works correctly. To compare the defective ISO file I use MD5 of a correctly generated ISO from my earlier attempts (see my first e-mail). However: the error of the incorrectly generated ISO remains and should be fixed. Rufus is a great tool, but converting your flash drive to GPT isn’t necessary for UEFI booting. All that will do is PREVENT Legacy BIOS booting, whereas keeping the flash drive as MBR allows both Legacy and UEFI boot modes. If you have a UEFI system, then it's not a problem to use Rufus that way, but it doesn't deliver any benefit over using Rescue Media Builder either. For the hash MD5 comparison, if the issue you're describing occurs every time you try to generate an ISO, where are you getting the “correctly generated” ISO you mentioned above? If that ISO was generated by an older Reflect version or even the same Reflect version on a different PC, then a hash difference would be EXPECTED. Different Reflect versions of course have different versions of various files, and even the same Reflect version with the same Rescue Media build settings can result in different ISOs on different PCs, because things like the included drivers, the RMBuilder.xml file, and the small Reflect.cfg file inside the Boot.wim file can be different, and any of those things will cause the hash to be different. That is normal. And since you mentioned an error originally, what is the actual error you’re getting? When this behavior occurred before the latest update, the problem included an actual error message. If you’re not seeing an actual error message at all and are just assuming that there’s a problem because the ISO is smaller than you expect, a size difference does not necessarily indicate a problem. A change in WinPE version might cause that, or if you're using WinRE, a change to the contents of your Windows Recovery partition could also cause that, and that can happen for a variety of reasons. Does your Rescue Media work when you test boot it? Please can you raise a support ticket by visiting https://www.macrium.com/support or email support (at) macrium (dot) com so that we can investigate further. Before the update to 3906, the error with the ISO file occurred only sporadically, so that I also had a working ISO. I then used this for comparison. I tried other programs like USB7Ice and others. All gave me error messages "ISO corrupt" or similar. If I create the USB directly with reflect everything is correct. I think it should be possible to use the generated ISO file as intended. If you haven't already done this and haven't gotten a response to the support ticket yet, try forcing a rebuild of your Rescue Media file set. To do that, open Rescue Media Builder and hold the Ctrl key, which will cause a small arrow to appear next to the Build button. Click on that arrow and click the "Force WIM Rebuild" option that appears underneath. See if the ISO is usable after that point.